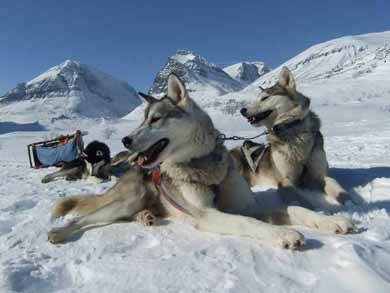 NB: Although included in our "dog sledding" category, this experience has no dog sledding component, but rather makes an excellent add-on activity to any of our dogsled tours in the Kiruna area. While the landscape of northern Sweden is ideal for dog sledding, the Sámi have never used dogs as a traditional mode of transport and it is the reindeer that forms the basis of Sámi culture. 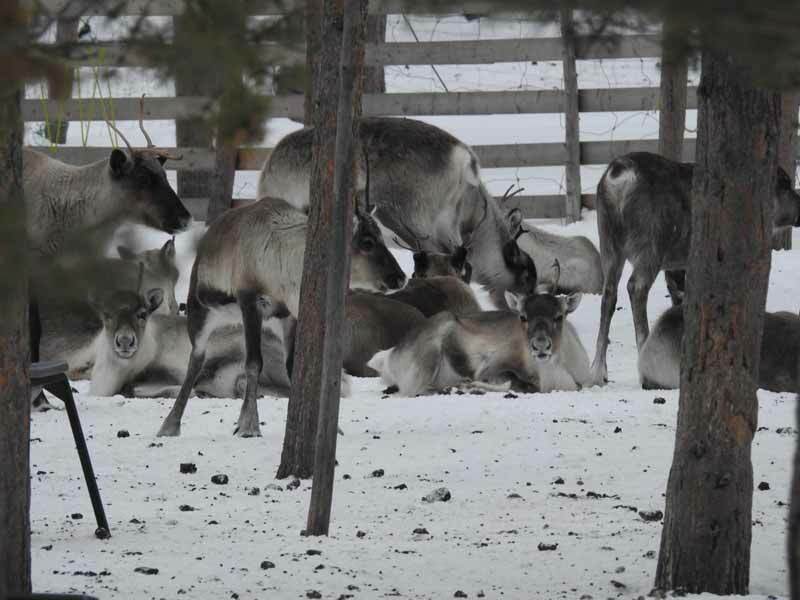 This activity gives you the opportunity to get "up close and personal" with the reindeer at the corral, including feeding the calves, trying your hand at the traditional lassoing technique and trying a short reindeer sled ride on the track at the camp. Just a few minutes from the small village of Jukkasjärvi, the location of the world-famous Ice Hotel, this is an ideal option for a Lapland winter experience, either in combination with one our dog sledding experiences in the area as an extra activity for your arrival or departure day, or as a stand-alone option if staying locally. The reindeer are central to Sámi culture. Photo: Resy van Beek. 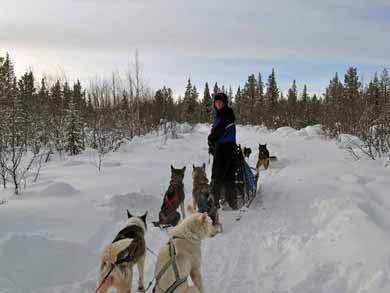 You start by travelling along the frozen Torne river to reach the reindeer enclosures by snowmobile-drawn sleds. Once you have arrived at the reconstructed Sámi camp you will learn about the importance of these animals, which connect the Sámi with nature. 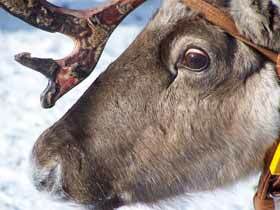 Your guide will introduce you to the culture of the Sámi and the life of a working reindeer herder. After meeting the reindeer, lunch is served in the Sámi lavvu (tipi). Sitting around the fire on a warm base of reindeer skins is a magical experience and the perfect setting to learn more about Sámi culture from your guide, while a traditional lunch is served of coffee and "suovas", the Sámi national dish of smoked reindeer (vegetarian alternative is available on request - must be advised in advance). Reindeer sledding was the traditional mode of transport for the Sámi, though snowmobiles are used today. Photo: Nature Travels. The Ice Hotel, a Sámi cafe and Sámi museum are within easy walking distance (approx. 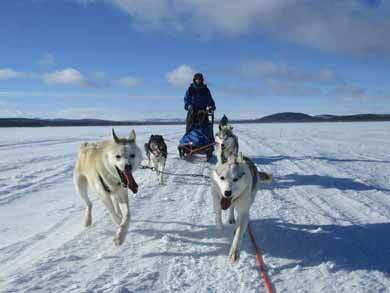 3km) and are popular options for additional activities (charges apply payable locally for entry to the Ice Hotel). This experience is suitable for all ages and ideal for those wishing to learn about the importance of these beautiful animals to the Sámi way of life. Tours start with pick up from local accommodation in Kiruna or the Tourist Information Office at 13.10, or from the Ice Hotel at 13.30. After your tour you will be transferred to the Ice Hotel around 17.20 or to your local accommodation or the Tourist Information Office in Kiruna around 17.45. Tours are offered daily between 4th November and 31st March (except 24th December). Low Season rates apply for tours between 04.11-30.11.19, 13.01-31.01.20 and 01.03-31.03.20. High Season rates apply for tours between 01.12.19-12.01.20 and 01.02-29.02.20 (except 24th December). All necessary equipment during the experience. Warm winter clothing: snowmobile suit, warm hat, gloves, boots and helmet. Lunch of fried smoked reindeer meat with flat bread and lingonberry jam. Lingonberry juice and tea/coffee. Special dietary options (vegetarian, etc) are available if pre-arranged. Please advise dietary requirements in advance. Transfer is included to/from Kiruna or the Ice Hotel at fixed times. See under "Itinerary" for details. General good health and fitness. Suitable for all ages. As a short experience with a limited active component, this tour is suitable for a very wide range of participants. Guests should be able to sit comfortably on reindeer skins on the ground in the lavvu. This tour has no minimum and is guaranteed to run from the first booking. This host has received a prestigious Swedish Ecotourism award for commitment to high standards to cultural and environmental sensitivity. Fly to Stockholm then onward to Kiruna by night train or domestic flight connection. Transfer is included to/from Kiruna or the Ice Hotel at fixed times. See under "Itinerary" for details. Ferry Dover-Dunkirk or Newcastle-Amsterdam for onward train connections to Kiruna. Read our blog article about the Sámi people. 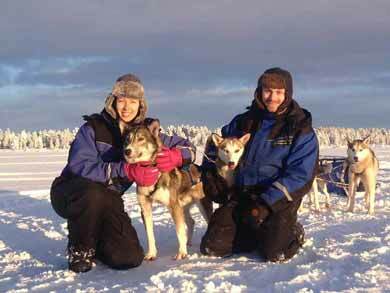 Read Sofia's account of an 8-day expedition by reindeer sled across the Arctic tundra.